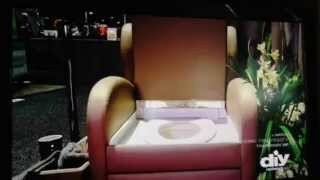 Video from Today's Homeowner: "ToileChic definitely has a unique product as part of KBIS (Kitchen and Bath Show) 2015." Host Allen Lyle demonstrates and then says, "I love this!" ToiléChic: Who Said your Powder Room Can't Be Swanky and Safe? For seniors and others with disabilities, the morning constitutional can be a minefield of slip and fall hazards. With the introduction of ToiléChic to the bathroom, seniors and other people with disabilities not only have a safer product to aide them in using the toilet, they have one that is unsurpassed in style and comfort. Instead of the current use of hard, embarrassing and potentially hazardous toilet aides, ToiléChic is a padded, upholstered chair with arms. However, while the fabric used is beautiful, comfortable, and comes in unlimited colors and patterns, it is not like any other fabric. Over 100 million yards of Crypton have been used from the White House to Buckingham Palace, proving the only choice for discriminating consumers and for the toughest of use. Originally developed for nursing homes dealing with incontinent problems for upholstered furniture, it has evolved to be offered in every fabric texture, including even designer ultrasuedes, velvets and chenilles. 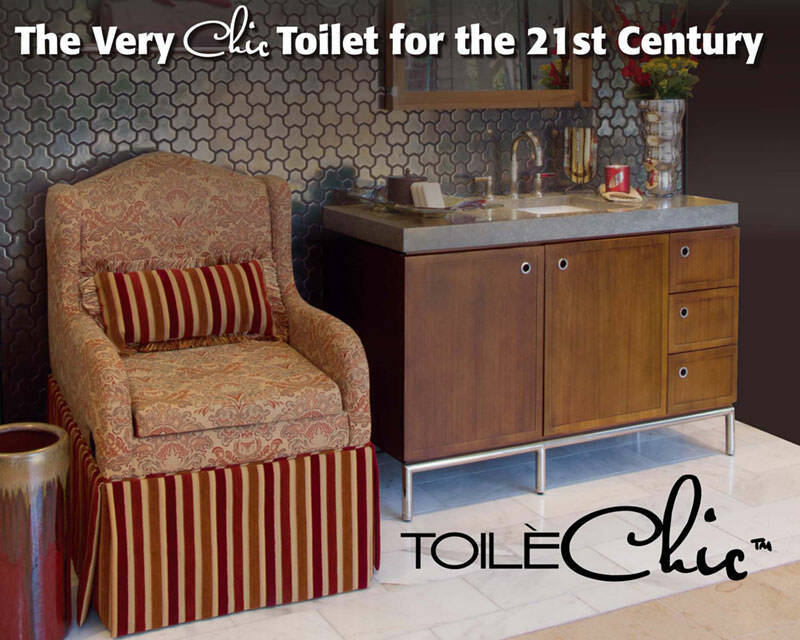 ToiléChic offers 5 chair styles, the choice of a Kohler or Toto toilet, is ADA height and, at 26" wide, fits into standard toilet areas. During four years of development, a sleek and modern hinge was invented along with a metal toilet bowl cover that connects the toilet to the chair, adding better hygiene by preventing stray particles from landing on the floor. A recliner style flush handle is also more conveniently located. 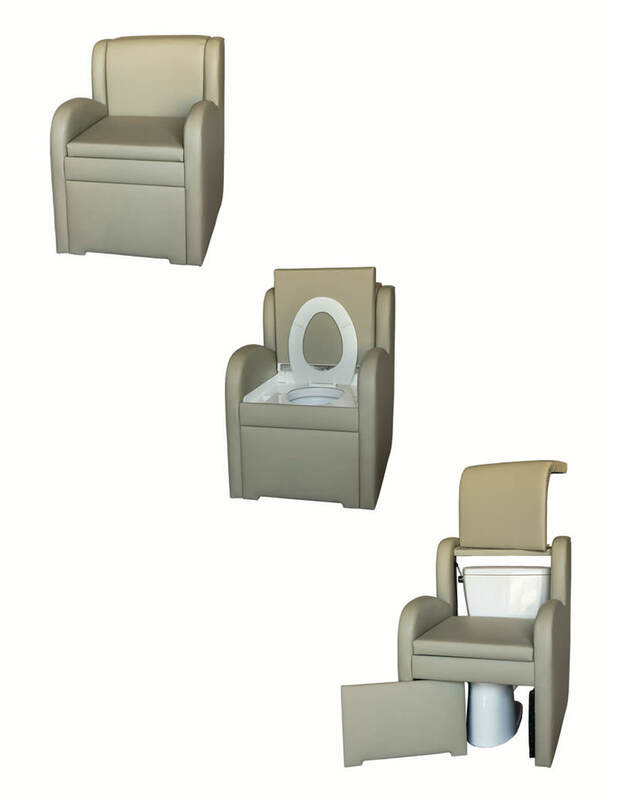 ToiléChic can be customized to accommodate the special needs of the user, usually at no additional cost. President and Owner of ToiléChic Kathy Monteiro said, "We challenge other companies to produce products that solve everyday problems for seniors and the disabled that look and feel mainstream and not institutional. It just takes a bit more creativity and effort but everyone deserves to be treated with dignity...especially those who face challenges." ToiléChic boasts that it is THE modern and chic toilet of the 21st century, incorporating aesthetics, functionality and cutting-edge technology to improve the lives of millions. For more on ToiléChic, visit www.ToileChic.com or call (855) 498-6644. At the Las Vegas Furniture Market, ToileChic was featured in a video presented at the seminar, Ahead of the Curve, which showed innovative products chosen from over 5 million sq ft of decor. 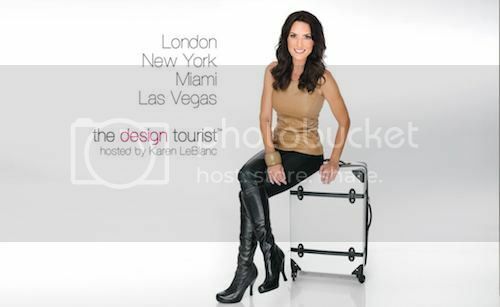 Designer and TV personality Tom Felicia was eager to be photographed sitting on ToileChic, as one of the first to see our product. Surely one of the more interesting product lines presented at this week’s KBIS in Las Vegas, Jan. 20-22, is Toile Chic’s designer toilets. 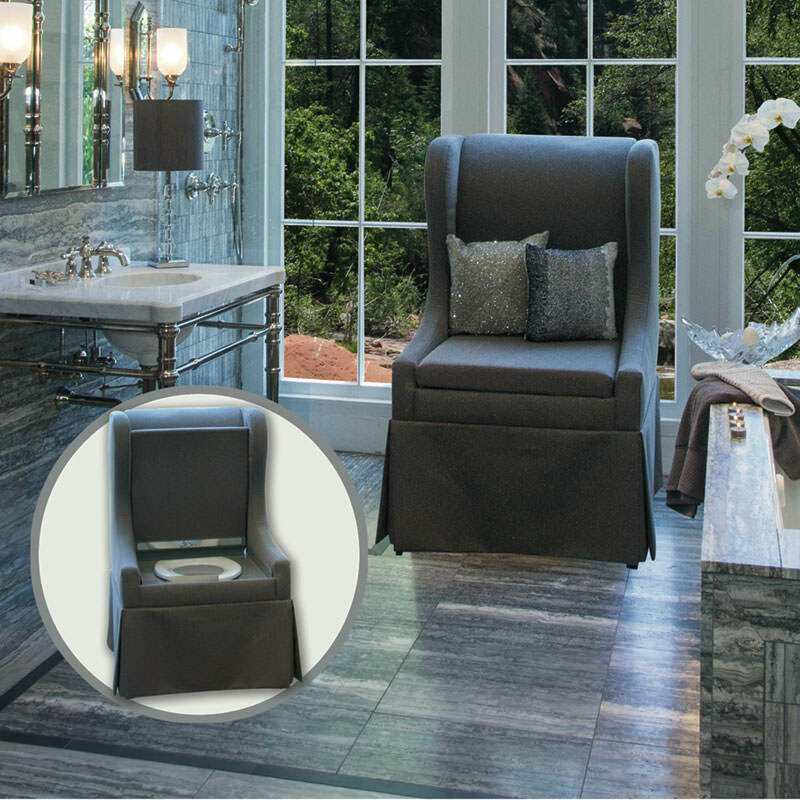 The line incorporates five different chair styles ranging from contemporary to traditional and a large selection of nonporous stain- and odor-resistant Crypton® fabrics and faux leathers to complement most bathroom decor. Other special features include a conveniently located recliner-style flush handle, a pop-out upholstered front and skirt for easy cleaning, and choice of a Toto or Kohler toilet/bidet. The Paris model is shown.